DA NANG (VNS) — A two-student team from Da Nang University overcame 628 peers' projects from across 30 universities to come in first place at an urban energy-saving innovation competition held in March. 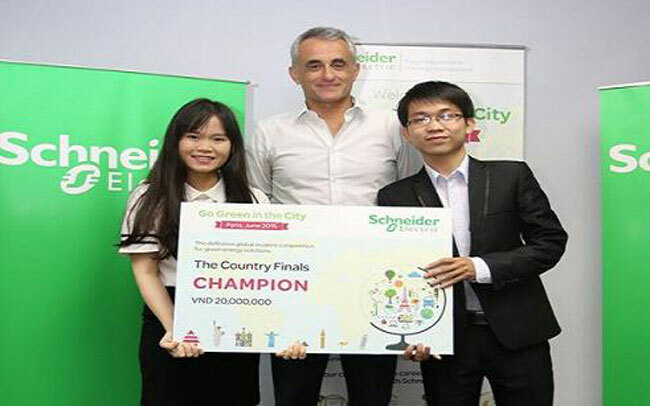 The competition, "Go Green in the City", run across the world by Schneider Electric, aims to encourage young people to find efficient, innovative ways to save energy in urban areas. Winners Tran Anh Hang Nga and Trinh Hoai Nam both majored in electronics at the Faculty "Excellent Centre" of Da Nang University's University of Technology. They said they hoped their innovative designs would be applied in real life. They came up with an idea to install bicycle rental stands in tourist-heavy areas, such as Bach Dang Street, Tran Phu Street, Truong Sa Street and Da Nang Airport. Nam said he and his partner Nga wanted to encourage people to use bicycles and electric bikes to reduce carbon dioxide emissions, which is how they came up with the idea. The bicycle rental stand would act like an automatic teller machine. When the customer inserts a credit card into the machine, the system will automatically push an electric bike out and deduct money from the rentee's card in proportion with the amount of time the bike is rented out. A magnetic device attached to the bicycle generates electric power from friction created by its movement on the road. The user will be given a discount based on the amount of power accumulated on the bike's charger when it gets back to the stand. "This system is useful," Nam said. "When people return the bike to the stand, it will be fully charged. This source of energy will automatically be discharged into the stand. People can use this energy to charge their mobile phones or light streets." The other project Nga and Nam came up with involved painting roads with photo luminescent paint. The paint would absorb sunlight during the day and give off light at night. To ensure the light is not too bright for drivers, an electronic censor would be installed that would notify a centre, which would adjust the street lights. Nam said he thought this innovation would save a lot of power used for street lights. "A street light normally uses 220W per hour," he said. "However, when there is photo luminescent paint, it would consume only 110W, which means saving 60 per cent of the power supply. If this idea is applied broadly, its efficiency will be huge." For time being, Nam and Nga are working hard to improve their innovations for the competition's upcoming regional and global rounds, scheduled for late April and June.